Step back in time and experience the wonder of Chicago’s spectacular exposition! 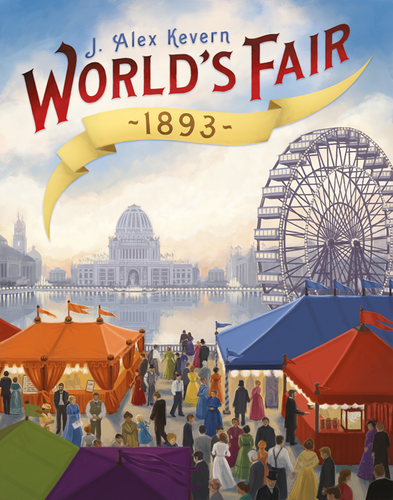 World’s Fair 1893 is an innocent looking game with a nice theme, 40 minutes of game play and way more depth than you are expecting. The object of the game is to score the most points over the three rounds. The timing of the rounds is marked off on a Ferris wheel that makes up the center of the board. Player’s actions drive the speed of the Ferris wheel. A player’s turn is straight forward. Place one of their player color cubes on one of the 5 exhibit locations that have been placed at random around the Ferris wheel. They can then take any special action allowed by an influential figure card acquired on a previous round. The player then takes all cards that have been placed at this exhibit location where they placed their cube. The number of cards at an exhibit location can range from 1 to 4. These cards include: influential figures with a one-time special ability, midway tickets that drive the Ferris wheel forward, and main exhibit cards that are used to build sets for game end scoring. All of the cards come out of one deck. So you’ll get a random mix of cards at the various locations. A player’s turn concludes with drawing 3 new cards and placing them at various exhibit locations. When the Ferris wheel makes a full revolution, a scoring round ensues. Each midway ticket a player has is worth 1 coin with the player who has the most tickets receiving a 2 coin bonus. Next, each of the 5 exhibit locations around the Ferris wheel is scored. The player with the majority of cubes in an exhibit location receives 4 victory point tokens and the ability to exchange up to 3 of their main exhibit cards for the same number of approved exhibit tiles for this location’s color. The player with the second most cubes in this location receives 2 victory point tokens and the ability to exchange 1 main exhibit card for one approved exhibit tile of this same location’s color. No points or card exchanges are made for placing 3rd or 4th. Only approved exhibit tiles, coins, and victory point tokens will be scored at the end of the game. Having a set of each of the 5 colors of approved exhibit tiles is worth 15 victory point. A set of 4 different colors is worth 10 victory point and on down to 1 point for a single color approved exhibit tile. As you can see, it is important to place first or second on the exhibit locations in order to convert your non-scoring exhibit cards into scoring exhibit tiles. The winner of the game is the player with the most points. The decision where to play that 1 cube each turn isn’t as easy as it looks. Is it better to grab influential figure abilities or exhibit cards? Even if the cards look good in a location, is it a location that I can get a majority? Then will I have enough exhibit cards of that location to gain the approval tiles? And finally, how fast do you want the Ferris wheel to turn? Be careful where you place that 1 cube each turn. It does make a difference. 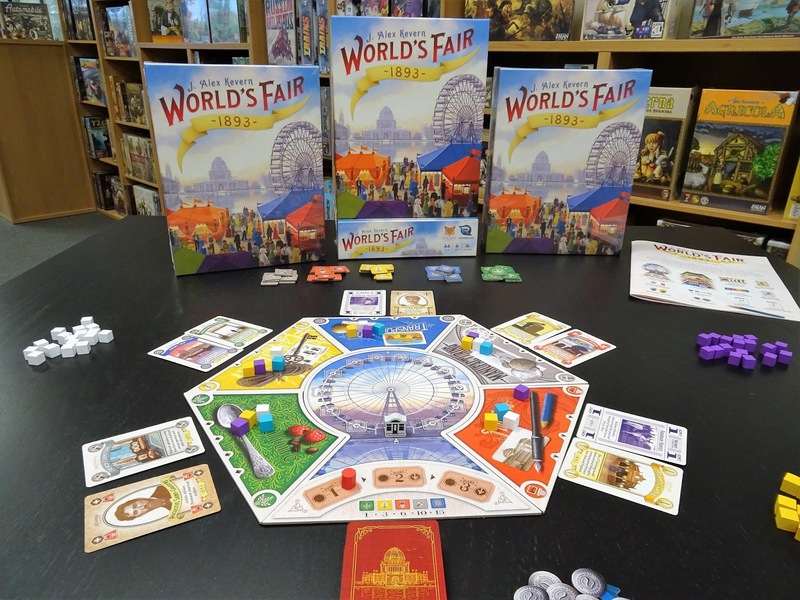 We have an open copy of World’s Fair available in our Demo Games Library for you come in and try.